We can carry out ALL aspects of tree surgery using our specialist equipment which is carefully maintained for a safe and professional finish. All our operatives are fully trained to use the equipment and work according to Health & Safety requirements. This means cutting a tree at the base and cutting it down as one whole. This operation is carried out when the entire tree is unwanted, but only if space and the condition of the tree permits. When a tree is unsafe to fell in one go or when the location will not permit (eg if buildings or roads are close-by), a tree must be carefully dismantled one section at a time from the top. This is removal of the lower limbs only to bring the trees crown (canopy) up higher, commonly to let more light into a garden and create more space. To cut back the branches all over the tree to reduce the overall canopy size and to create a neat shape and allow more light into an area. To remove a percentage of the branches to reduce the weight of the canopy and increase the amount of light that can filter through. The percentage of branches removed depends on the individual tree to create the most effective yet natural looking result. The removal of dead, dying and diseased limbs to improve the health and appearance of a tree and, of course, to prevent possible accidents and damages from occurring. Fruit trees require special and regular pruning of their branches to maximise their fruit yield and to prolong the life of old Apple and Pear Trees. This is often carried out in the Autumn. Cutting the large branches right back to the main limbs or even trunk of a tree to encourage new growth under a controlled manner. This procedure is often carried out on Poplar, Lime and Hazel Trees. After a tree has been cut down there is the stump left. This can be simply cut down to ground level with a chainsaw but the stump and its roots will remain below ground level. A Stump Grinder is a machine with sharp teeth that will grind out the stump leaving a clear hole in the ground, ready for new planting or landscaping. If you wish to keep the timber for fuel from the tree(s) we have worked on, we can cut it up into manageable sized logs and stack it in a neat pile for your use. The brash ( smaller green branches) and limbs of a felled tree are passed through a specialist machine which chops them into tiny pieces and shoots it all straight into the back of the tipper van, for easier waste disposal. Just ask if you wish to keep the chippings which may be suitable as a garden mulch. Before a can be carried out, it must be first checked with your local Council if there is a Tree Preservation Order (TPO) on the tree. It is an offence to carry out works without prior permission on a tree and can result in heavy fines. 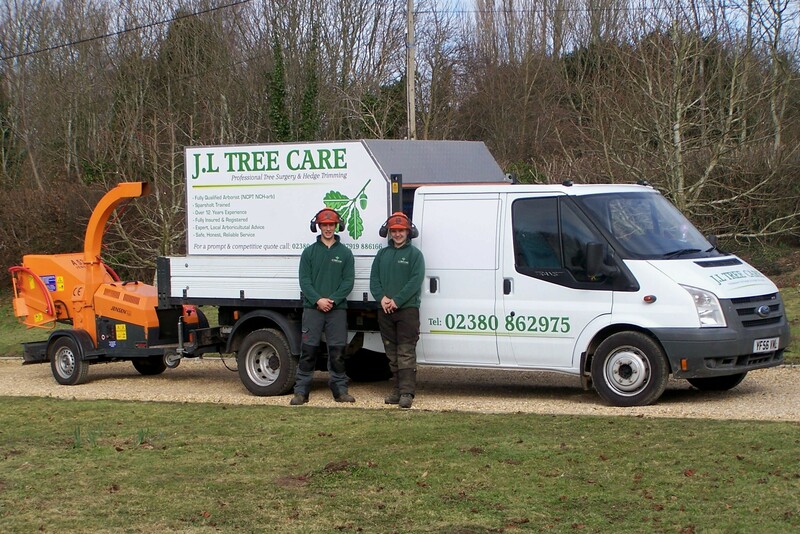 J.L Tree Care can guide you through the process and even submit your TPO forms for you as it can be a bit daunting to do yourself. Click Here for more information on TPO. During a free site visit Josh Laurence, a qualified Arborist can advise you on the most appropriate action to take on your tree, for its health and your benefit, We can advise what procedure to apply for if you are submitting a TPO. A competitive quote to carry out the works is also provided. Click here to request a quote / advice. Trees that have been damaged by strong winds and storms or dead must be dealt with promptly to avoid damage to property or injury to persons. At times, the tree may be too dangerous to climb or fell so a hydraulic platform (cherry picker) is used to safely carry out the work. Contact Us for a prompt response on Emergency work. Hedge trimming involves lightly and evenly cutting back the sides or top of a hedge to maintain a neat and dense appearance and to encourage growth. Hedges should be trimmed regularly to keep them under control). Topping is when the height of a hedge is brought down by cutting out the top section of a hedge often with a chain saw. Be sure to check with your local council that you have permission to remove established hegeJ.L Tree Care can submit an Application Form for you.